So, breakfast tacos, where to begin? For the uninitiated, breakfast tacos are an institution in Austin. They’re easily found at countless restaurants, coffee houses, and food trailers around town. They’re inexpensive and convenient. Everyone has his or her favorite filling. For me, bean, egg, and cheese or potato, egg, and cheese are the best, but I also love a spinach, cherry tomato, egg, and cheese on a whole-grain tortilla. Kurt’s preferences are chorizo, egg, and cheese and bacon, egg, and cheese. They’re usually made with flour tortillas except for that multi-grain option I mentioned which I’ve only seen at one place in town. Also, salsa is served on the side in little cups with lids if the tacos are to go, and I always request an extra cup. With so many options for going out for breakfast tacos surrounding me in this town, I’ve never made my own until now. And, to be honest, these are really just something like breakfast tacos. What we have here is a fancy, worldly relative of the breakfast taco. When I was looking for something different for a weekend breakfast, I found truffled egg tacos in Nuevo Tex-Mex , and I always have fun cooking from that book. That main recipe does require two, not one, black truffles which are sliced over eggs, and the filling is then rolled in blue corn crepes to make fancy-pants tacos. Luckily, since I was fresh out of whole black truffles, variations on this theme are offered. I went with the wild mushroom-egg version and added a little truffle oil to the mushrooms after they were sauteed. As simple as this dish seems, and as familiar as the concept of the breakfast taco is, I was a little nervous about making it because I’d never before made crepes. Without the crepes, this was just scrambled eggs and mushrooms. I doubled the recipe so I’d have plenty of batter for practicing. The first crepe was, of course, a failure, but then things improved. I made my crepes larger than the five inch diameter suggested, so it was a good thing that I had doubled the batter. Blue cornmeal was combined with milk, eggs, and melted butter and then was left to sit for 30 minutes before using. My bigger crepes cooked for just over one minute on each side. The filling was simply sauteed mushrooms which were drizzled with truffle oil and scrambled eggs. I added some grated monterey jack cheese and chopped garlic chives as well. I always wish blue cornmeal were really blue instead of grayish-pale blue, but regardless of the color, it made a nice crepe with a sweet nuttiness about it. The tenderness of the crepes made them very easy to fold and turn around the filling. It was a little strange to sit down to a meal of breakfast tacos with fork in hand and the aroma truffle oil in the air, but I could get used to this sophisticated variation. Wow! Now I couldn't eat this for breakfast but I could definitely eat one at any other time, breakfast, dinner or snack! Beautiful! And really perfect crepes, Lisa! A brilliant idea. I think I'll take yours over standing in line here on an Saturday morning to get breakfast at a restaurant. Sounds terrific! Also, do you like that Simple French Foods book that's up there on your logo? I'm curious..... I would like to try it! RM: You know, I haven't cooked much from Simple French Food. It's a classic by Richard Olney, and a lot of other cookbook authors have attributed recipes to him and that book. I've used it more for reference, but I'll post something from it eventually. Definitely a good one to add to your collection. This is so nice. Eggs are one of my all time favourite foods, and the blue wrap makes it look very special. Now I can have this for breakfast, lunch or dinner. I love the blue corn crepe. Totally clever!! Nice, blue corn crepe makes this wrap look even sexier! It looks a bit heavy to me for breakfast but I would sure love to have this for lunch! Looks delicious! But... the first time making crepes? I thought everyone made crepes...:) Well done on your first crepe making though! Yum! I like the sound of your filling - but also adding some chorizo too :P I haven't seen blue cornmeal before, I'll keep a look out for it. A wonderful reacipe! Very original and so appetizing! You never cease to amaze me Lisa. You don't see many breakfast tacos in Seattle, but now you have me craving them. Big time. I haven't made crepes before, but yours look perfect! I have a ton of cornmeal, so maybe I need to try this. Such a delicious meal. Yum! I love blue corn tortillas. So nutty and earthy. This looks like a four-star breakfast in my book. I've never heard of blue corn crepes. It looks delicious and I love wild mushrooms! When I was in Austin - I was stunned at the number of places that showcased breakfast tacos - it is indeed a local food. Your version looks delicious and I love the blue corn tortillas. What a delicious stick to your ribs breakfast. What a special breakfast this is! Your blue-corn crepes look perfect and the filling delicious! looks like a yummy, filling breakfast! love the blue corn crepes. 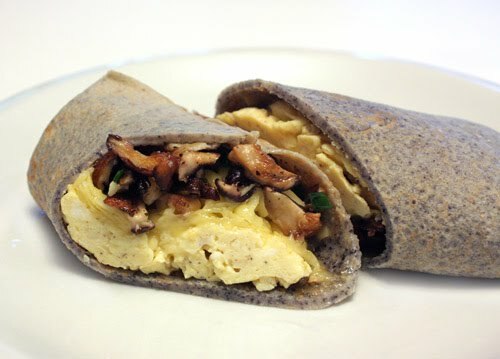 The blue corn crepes are just gorgeous and I love the filling of egg & wild mushrooms, perfectly delicious! What a great way to start the day, I'd even have them for dinner! It looks very appetizing but I couldn't eat this for breakfast. Any other time of the day this would be perfect. I love your blue corn crepes, very special indeed. I wish I could have this for my Sunday b'fast! I have some blue corn flour that stares at me each time I open the freezer, and brought back some mushrooms from Ithca NY, so it is on... Hubby would make me attempt the flan I saw on here, but I still owe him a ricotta cheese cake I saw a while back...Your hired! How cool! I love the idea of a blue corn crepe - YUM! WOW! Those look amazing!! 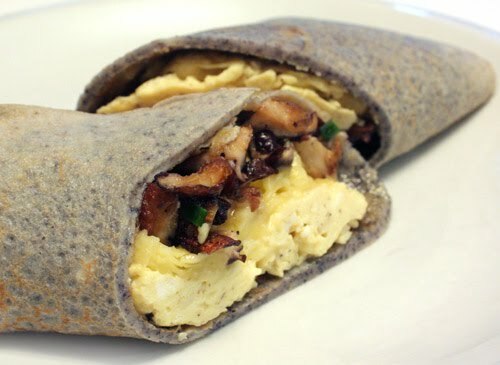 I love the idea of the egg with the wild mushrooms and blue corn crepes. I've never made a crepe!! Seems a little bit intimidating. I am in love with that color of the blue corn. Love egg mushroom together. Breakfast is my favorite meal of the day because of fantastic dishes like your blue corn crepe tacos! The wild mushroom and egg omelette would be great on its own but wrapped in these crepes, it's even better. I wonder where I can find blue corn flour . . . ?